I’ve been blogging on one site or another for over 12 years now. It doesn’t take nearly that long — in fact it takes about two minutes — to realize that people like to make excuses about why they aren’t wealthy. No matter how simple the topic or suggestion might be, there’s someone with an excuse about why it won’t work or why they can’t do it. I’m not going to address these individually other than to say they all have very simple solutions for someone willing to take a bit of advice. It’s not only blog readers. I used to see this all the time in real life. My wife and I were financial coaches for years. We would meet with people to help them with basic financial issues (mostly budgeting and getting out of debt) at no cost to them. They were referred to us when they contacted the organization we were volunteering for and asked for help. We lived in Pittsburgh at the time and got all the referrals for the North Hills in Pittsburgh where we lived. The person needing help would contact the organization. The organization would send them a note with our contact information. The organization would send us a note with the person’s contact information so we’d know they might be contacting us. We were NOT supposed to initiate contact with them. They had to contact us or else the referral simply dropped. Of the people we were sent referrals for, maybe half contacted us. It was probably closer to a third. Of the people who contacted us, maybe half would commit to completing a budget we would send them. It was probably closer to a third. Of the people completing the budget, maybe half would agree to an in-person get together to review the budget form. It was probably closer to a third. Of the people who met with us, maybe half would take our suggestions, work on applying them, and agree to a second, check-up meeting. So if you’re doing the math, somewhere between 2% and 6% would actually go through the process, do the work, and then take steps needed to get their lives on the right financial path. Most of them wanted a 15-second answer to a 20-year problem. Seriously. They wanted to know how we could get them out of debt quickly after they had taken five, ten, or twenty years to build up that debt. Oh, and they didn’t want to have to change any of their habits to do so. Not only that, but of the people who did make it through to the budget review, most wanted no part of making any changes. We had people tell us that things like weekly manicures for $60 each and nightly trips to a restaurant were “necessities” and there’s no way they could cut them out. We’d explain they then either needed to make more money or cut something else, two things they couldn’t or wouldn’t do. Ugh. Now I must pause a minute here and say there are people who legitimately have issues. They don’t make enough to do much of anything and might be unable to work. But those people are few and far between. 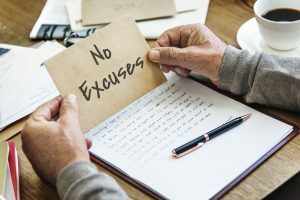 The vast majority of people who claim they can’t take any financial steps are simply too lazy and would rather make excuses than take action. No one is able to do nothing and get good raises. People who do nothing get do-nothing raises (which aren’t high). No matter what your profession, there are people who make more and people who make less at it, so don’t say “that doesn’t work for my job”. It does work for your job. Find someone who has done it, take them to coffee, and pick their brain. Growing your income doesn’t take a 20-hour commitment each week. You can make simple, small steps during the normal course of your day that will add up to great things over time. You don’t have to have 8% raises each year to do well financially. If you get 2% raises for no action but then do something and get 4% raises, you will be MUCH better off! That 2% difference is HUGE! There are tried and true steps you can take to grow your career. How do I know? I did them over a 28-year career! I saw others do them and get ahead. I taught them to people and saw them get ahead. Do not tell me they can’t be done or do not work because I know otherwise. And it’s not just careers. I could make the same arguments about almost any financial topic — saving, investing, retirement, side hustles, and on and on. So STOP MAKING EXCUSES! Personally, I don’t care if you are poor your entire life if you refuse to help yourself. That’s your choice. But don’t try to justify it with one excuse after another. I’m tired of hearing it. If you want help and will do something, others will help you. I will help you. That’s what this blog is about — helping people achieve financial independence. But if you want to make excuses, you’re not doing anyone any good — especially yourself. Making money excuses can derail you over the long run. It reminds me of all the times I’ve said I’ll start working out on Monday because it’s the beginning of the week. With finances, a lot of people want to start the following month since you typically budget on a monthly basis. That leaves them open to making a number of mistakes. Love the rant ESI, and it’s so true. Back when I worked at the call center making $22k per year to pay my way through college, I met a lot of people who were decades older than me who didn’t want to change. Unfortunately that call center work left the state long ago, so people that tried to stay in those kinds of roles had to either start working about 45 minutes-an hour away from that location, or take retail jobs (and I see many of them in retail jobs). I’ve met a lot of people who want to spend like they’ve always spent, in a way that got them into debt, but somehow magically their debt will go away(???). And others that have been in their job for decades, have no interest in changing or moving up, but complain about their circumstances. I grew my income to over six figures from those days in the call center. How? By getting out of call center type jobs, getting a bachelors, getting an MBA, seeking out new and different opportunities, volunteering to speak in front of 30k people. You know, working hard and putting myself out there. It’s amazing how many opportunities there really are, you just have to look around. I agree that there are really a lot of opportunities out there if you just put out a little effort. Even taking some basic positive steps can improve your situation. Had a gentleman tell me years ago that I needed to give him and several other employees nice raises; not because they did great work but because they were all behind on their bills. Their being in debt was not their fault, it was mine and it actually just showed what a lousy business owner I was. A good business owner would make certain that his employees had plenty of money to pay their bills with some extra left over. When I said let’s look at your budget and see where there might be a problem, perhaps I could help. I was told, what they spent their money on was none of my “flipping” business, I just needed to pay them more. I find that the people who are the most accomplished are those that can breakdown big problems into tactical steps, and then take that first step. I view people’s commitment fleeting and almost irrelevant — if you want to get healthy, just walk into a gym, any gym; if you want to lose weight, just choose to control what you eat that dinner; if you want to be successful, volunteer for highly visible projects; if you want to become more financially sound, just understand your spending habits. And then once you take that first step, you take the second step until it becomes natural. Success is almost always an outcome of a journey. Well said. Money issues are often not the true problem; they’re the glaring symptom of something deeper. Trying to address the root cause may not be easy, but it’s often pretty straightforward if you can be honest with yourself. So very true. I’ve met people making way less then me that are smarter then me, more skilled then me, and we can go on. They didn’t put in the effort to raise their income or apply themselves that extra mile. They made excuses. Even without equality, attitude is usually the deciding factor. The same is true with savings and investing. It’s all about how you apply yourself. It’s not even that hard. Little steps like negotiating a slight bump in pay when starting a position add up. Saving an extra hundred dollars a month will have a large impact over forty years. Investing in the right makeup of index funds only needs three basic funds to get started. The worst lies are the lies that people tell themselves, and believe! So true. This is the same in medicine/health. People want to feel better. Maybe they just had a heart attack, but they say “I just am not a walker”. “I do not like exercise”. This is after having a heart attack. If that is not a wake up call I don’t know what is. As for the rest, we can only inform. It is up to people to make the changes. We are all just advisors. My heart breaks every day for the people I know that are broke but they don’t see it’s in large part because they spend money they can’t afford to spend. There are also the people I know that think a failing business will some day generate the income it use to, despite the lack of smart efforts to turn it around. Thank you for the rant. #nomoneyexcuses – YES! I’m all for it!! It’s hard to get out of the cycle of not doing anything. But that initial burst of effort makes all the difference. I urge friends to do just ONE thing to make their lives better instead of being overwhelmed with a million things they “need” to be doing. ESI, you’re on fire … I love the rant.! Good post! I will say that I’ve had at least one career where making more wasn’t really an option – the military. Once you hit field grade officer rank, you could shoot for faster promotions, but otherwise it was basically on rails. Good day and really interest about all your articles. Would you able to provide advice if I’m not American and working in the middle east? It would be great if you could offer some tips on how I could achieve Financial Independent. I would say the principles are the same wherever you go: earn, save, and invest. Read all the posts here — surely some will help you. Gosh, excuses are just too easy. For me, I set goals and try my best everyday to take the required steps to reach those goals. Work hard, study hard, save, invest, and make smart decisions along the way. I started this journey with nothing and am now set up nicely after following those basic steps. It did not come quickly, but it did materialize a few decades later. The other reason I love the post is because now I know that you used to live in Pittsburgh, which is where we are. Totally spot on. There’s no room for excuses when it comes to your money. You either make a plan and stick to it, or you don’t. Rant aside, something I’ve been struggling with is whether or not to charge for such a service. Although I want to do this for free, I’m concerned that they will not take it seriously. Do you think that if these people had put money on the line that there would have been more follow-through? Yes, I think people will be more involved and likely to take action if they spend money on advice. You’d think to hear that would be enough. As someone who has taught financial resource management classes for over two decades, I can totally vouch for your statistics. People are excited when they come to class to try and improve their financial situation, but it’s the day-to-day commitment after the class that tends to fall by the wayside. I would liken bankruptcy to your heart attack analogy. You would think that when someone has hit rock bottom that they would be desperate to change their habits (just like after a heart attack). But human nature being what it is, they go back to the way they were because it’s their comfort zone. Change is hard. I get that. If you don’t want to change, don’t. But don’t b**** about it when your situation never improves. Unfortunately it is 100% easier to do nothing than anything. Even the important things and especially the overwhelming things. People ultimately just need to find their own path and if they decide not to then is their mess to live with. Quite the rant, but it’s true. Changing habits puts people out of their comfort zone. The scared or fear of change prohibits them from making rational decisions and cutting out excuses. If they don’t truly want to better themselves, then there is no help for them. The few who are willing, will probably find it is easier than they thought and will feel so much better after making the necessary changes. So true! People do not realize that they work to pay for the lifestyle they chose. Most of what we consume is a choice and not a basic need. Loved your rant. Reminded me long ago when I was in my mid-20’s and won a settlement due to a car accident. I banked the money with dollar cost averaging deposit in a solid Vanguard fund and took maybe $30 to treat myself to some perfume. My friends on the other hand were fit to be tied telling me to go on vacations, buy new clothes, makeup etc. With the other part of the 4 years structured payments, that paid for college in a profession that I can find a job anywhere in the country and make a good salary. The money I put in my Vanguard account is still sitting there growing. Course I have always been the kid that would put off the 1 marshmallow for 3 marshmallows in the future. I gave a sibling Larry Winget’s book “Your broke because you want to be” because I was tired of hearing the excuses and BS being spouted about money especially after my sibling told my college bound child how they could make good money on penny stocks with some of their saved high school funds, from the sibling who doesn’t invest in any stocks or have any substantial savings. The sibling was insulted, never read the book, but at least stopped giving my children financial advice. These are great points that are very challenging, ESI, but they’re good for all of us to hear periodically! Mom got her masters while working full time and raising 3 kids by completing a course a semester. The year she graduated, she was the only teacher in the county to get a raise because they had a wage freeze, but having the degree put her in a higher category. I wonder how different the financial landscape would look if people could see how their thinking was holding them back. That financial freedom is not a zero-sum game. That identifying with the 99% is precisely one of the main reasons why they will always be in the 99%.